A compound called roxarsone [containing arsenic] is added to chicken feed to keep down Coccidia parasites in the gut. It is not just added for some cosmetic reason, as the silly wording above would have you believe. In 2011, a study found that chicken meat with detectable levels of roxarsone had 2.3 parts per billion (note the “b”) of inorganic arsenic, which is the kind that is truly toxic. Chicken meat with no detectable roxarsone had 0.8 ppb inorganic arsenic, threefold less, and the correlation seems to be real. (Half of the factory-raised chickens sampled had detectable roxarsone, by the way). This led to the compound being (voluntarily) withdrawn from the market, under the assumption that this is an avoidable exposure to arsenic that could be eliminated. And so it is. There are other (non-arsenic) compounds that can be given to keep parasite infestations down in poultry, although they’re not as effective, and they’ll probably show up on the next edition of lists like this one. But let’s get things on scale: it’s worth comparing these arsenic levels to those found in other foods. White rice, for example comes in at about 100 parts per billion of inorganic arsenic (and brown rice at 170 ppb). These, by the way, are all-natural arsenic levels, produced by the plant’s own uptake from the soil. But even those amounts are not expected to pose a human health risk (says both the FDA and Canadian authorities), so the fifty-fold lower concentrations in chicken would, one thinks, be even less to worry about. 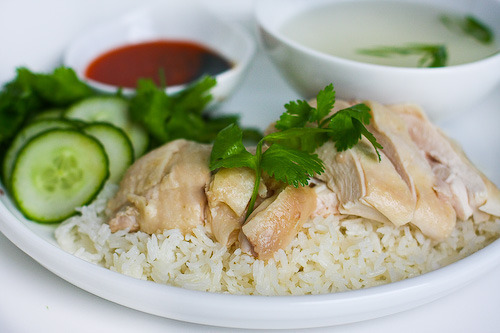 If you’re having chicken and rice and you want to worry about arsenic, worry about the rice. Rice is pretty well tolerated by people who have problems w/ grains (as is, maybe, oatmeal) and won’t in itself make you fat or diabetic. I like rice. Wish I could get it from relatively safer soil, or industrial post-processed to remove arsenic/lead/etc. So that my mercury-laden farmed-fish sushi can rest easy on its bed of rice.